Product Description: A snack bar with a world-famous blend of rich cinnamon, delicious fresh baked flavor, and melt-in-your-mouth frosting. 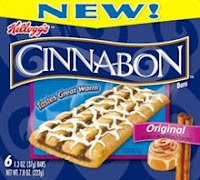 I recently received a box of the new Kellogg's Cinnabon Snack Bars (Original) courtesy of Mom Central. I was anxious to try one because I love cinnamon and cinnamon rolls, but I was participating in the Game On! Diet for the past four weeks and unfortunately wasn't able to try them out right away. I did, however, pass along two of the bars for my husband and his co-worker to taste so I could gather their opinions. They both thought they were pretty tasty, but they didn't feel like the portion size was enough for a meal. So now that my "official" diet ended yesterday, I finally got around to tasting one of these bars for myself! While the bars are ready to eat from the pouch, I decided to microwave one according to the directions on the box. I did enjoy the bar and thought it had a good cinnamon flavor, but I admit that it didn't fill me up enough for a meal. I think these Cinnabon Snack Bars are probably best for a little snack or dessert. The only issue I had was the amount of calories in the bar -- 150 calories -- not a huge amount and definitely less than a real cinnamon roll, but still.... There was also 4.5 grams of fat (although there were 0 grams of trans fat so that's a plus) and 13 grams of sugar. Check out the nutritional information for more details. I think these bars manage to taste good, when they do, by being pretty small, so they don't fill an adult up for a meal. But they sure are great to have in the car for emergencies!!! My boys LOVE these bars. They tried them this weekend. I agree, not big enough for a meal but enough for a snack. I don't usually eat this kind of thing, but I'm tempted to try these because they're Cinnabon which I love. I thought perhaps this was a post about a new snack cake team. LOL. I don't like snack bars in general. They are usually too sugary for my taste and don't do much filling up either. I thought they were really good, we tried the Caramel and the Cinnamon flavor. My middle son LOVED them, and I have sent a box to my oldest son in college. Of course, he would probably eat anything!!! My grandkids love these things. They range in age from 12 to 4. I get them at Costco, but they are out with no indication that they will get more. I'll have to check the supermarket or order them online.